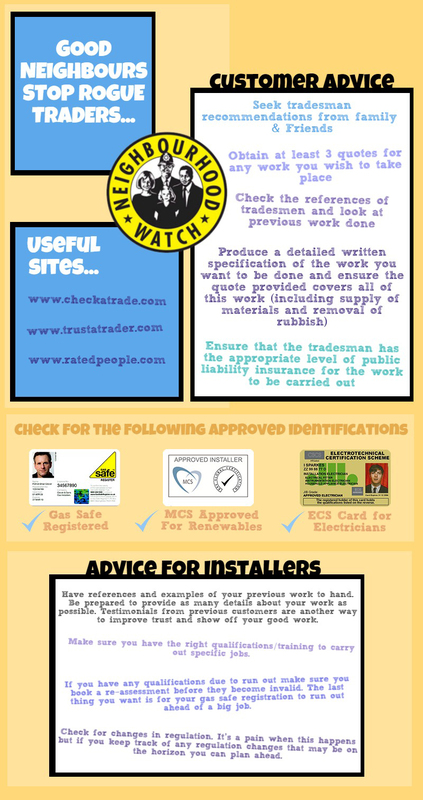 A new campaign called Good Neighbours Stop Rogue Traders has been launched by The Federation of Master Builders (FMB) and the National Federation of Roofing Contractors (NFRC). They are encouraging people to carry out more thorough checks on traders in a bid to crack down on doorstep criminals. The campaign is focused on neighbours looking out for one another, especially those who are most likely to be targeted by doorstep criminals and encouraging them to step in and alert the authorities. Doorstep crime involves criminals preying on vulnerable people – often older and living with ill health – by cold-calling at their homes and pressurising them into paying extortionate prices for unnecessary goods or services. The outcome is often botched jobs on roofs, driveways and gardens and the practice often sees victims being frogmarched into banks and building societies to withdraw large sums of cash. Consumers and Tradespeople alike should pull together and help stop criminals. Rogue traders give the trades a bad name. Make sure you report them immediately.